If you’ve never been to the Vault’s venue, now is the perfect opportunity to go. Offering up an eclectic mix of theatre, comedy and music The Vault’s Festival is teeming with life deep beneath Waterloo’s streets in London, not far from London’s West End shows. There is definitely something for everyone and with an on-site restaurant and bar you can certainly make a night of it any day of the week. 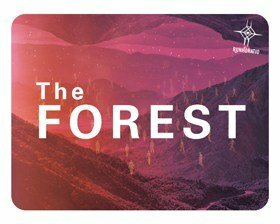 As part of this mad emporium, Runhoratio’s The Forest benefits from this venue’s quirky space – cue a cavernous vault, a bunch of wide-eyed strangers and a mix of nerves like your first day at school and you’ll get the impression of what entering into the immersive world of The Forest feels like. The stripped back venue helps to create the world of X-NN systems where humans are nodes and robots rule supreme. Greeted by cyborg guides, your sci-fi adventure begins; separated and numbered, groups are formed and experiments are the order of the day. Reminiscent of kindergarten games, the experiments are playful and plentiful. Silly interactions and conga lines meet with introspective invites to be still, to explore sensory experiences and let go. There’s an undercurrent of mindfulness throughout the show and the robotic world you inhabit reminds you that in the real world you are more than a cog in a corporate wheel and the experiments are there to ‘awaken’ you. The actors do a superb job of keeping everyone attentive and in line. A hard task to manage considering all the action takes place in one room, therefore the only psychological change of state comes from within. It’s fun and not exactly taxing, the acting standard was high and each cyborg had their own charm and way of easing people into the action. Okay, there was a technical hiccup with the show’s video introduction but otherwise, the sound and lighting was spot on for creating atmosphere and the actors kept the show alive without the need to reboot the proceedings. For a mid-week pick me up it’s definitely worth the night out. Underperforming? Malfunction? Sluggish? Totally natural for a human node in this day and age. In response, we have developed The Forest, a high-tech, dedicated testing facility for human nodes, just like you. Experiential and immersive performance company, Runhoratio, is premiering XNN Systems: The Forest as part of London’s VAULT Festival 2016. Supported by the National Lottery through Arts Council England, The Forest is Runhoratio’s most ambitious and experimental performance piece to date. XNN Systems: The Forest is an immersive performance that invites each audience member to become a human node in a data processing system run by fictitious company XNN Systems (www.xnnsystems.xyz). Human nodes are responsible for keeping their minds as healthy and productive as possible. XNN System’s Forest ensures that all human nodes are processing at maximum efficiency by putting them through a number of physical and mental tests, carried out by XNN’s team of highly trained staff. Bizarre, unusual, and therapeutic, audience are immersed in a variety of encounters reflecting on different elements of the human condition – both fun and tongue-in-cheek, whilst exploring deeper levels of self-reflection and awareness.